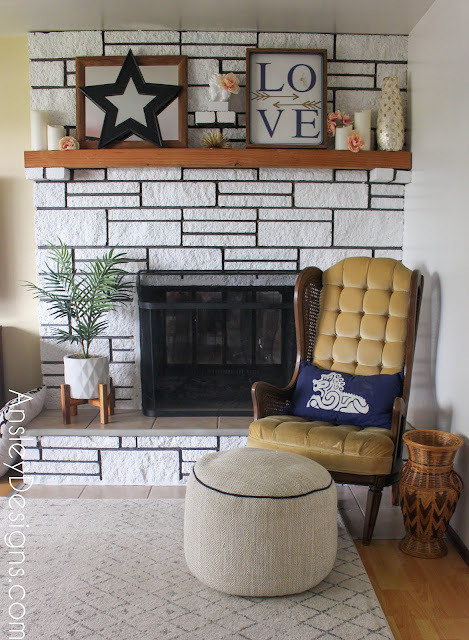 Ansley Designs: Fireplace Makeover: How to Paint a Stone Fireplace in One Step! Fireplace Makeover: How to Paint a Stone Fireplace in One Step! Well I finally did it! 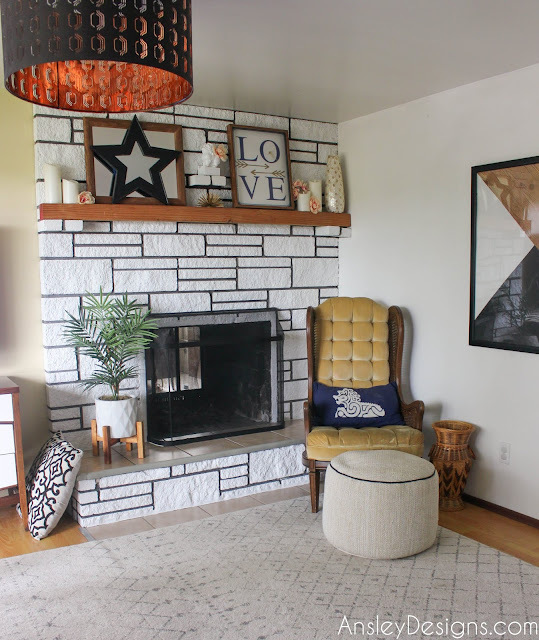 I painted the fireplace in the living room! I was hesitant to paint it since I'm renting, and I know some people are funny about painting over "nice stone". 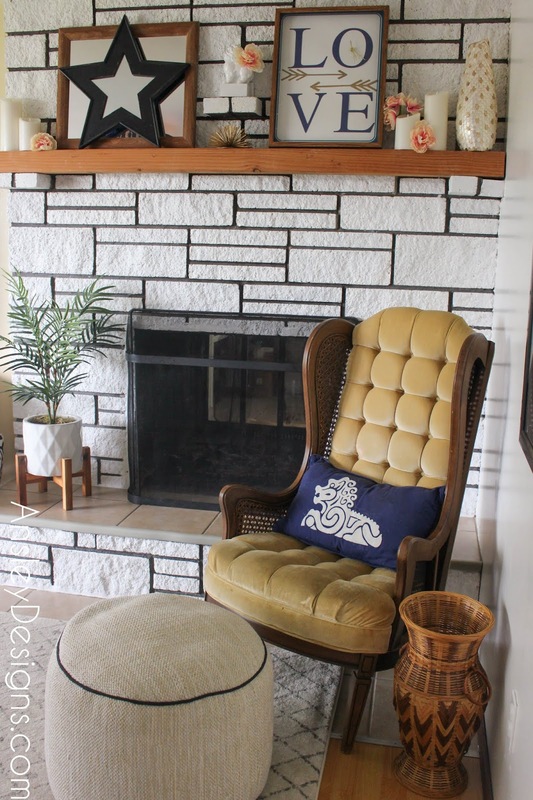 However, when I was renewing my lease (and they raised the rent *cries*) I had them throw in letting me paint the fireplace! PERMISSION GRANTED! It wasn't horrible before. The colors were muted, and it was definitely dingy from smoke. Okay, that's a lie...seeing the side by side of the before and after, it was horrible before! 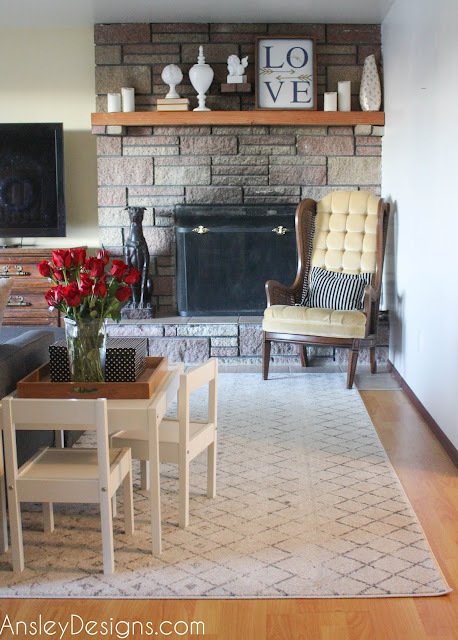 Originally, I envisioned a dark grey or black fireplace since I'm planning to paint the rest of the room white. 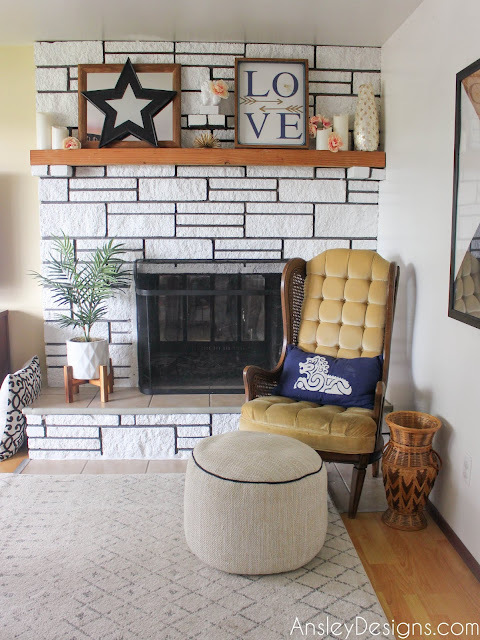 Unfortunately, the hearth has a taupe colored tile which I thought would contrast too unflatteringly with the dark color. Now if the tile was JUST on the hearth I'd have painted it the same color and called it a day. But they put tile on the floor in front of the fireplace, about 2 feet out. Personally I don't see the point since there's a hearth that extends beyond the fireplace...and it looks silly in my opinion. I'm glad my rug covers most of it, so it's not noticeable. 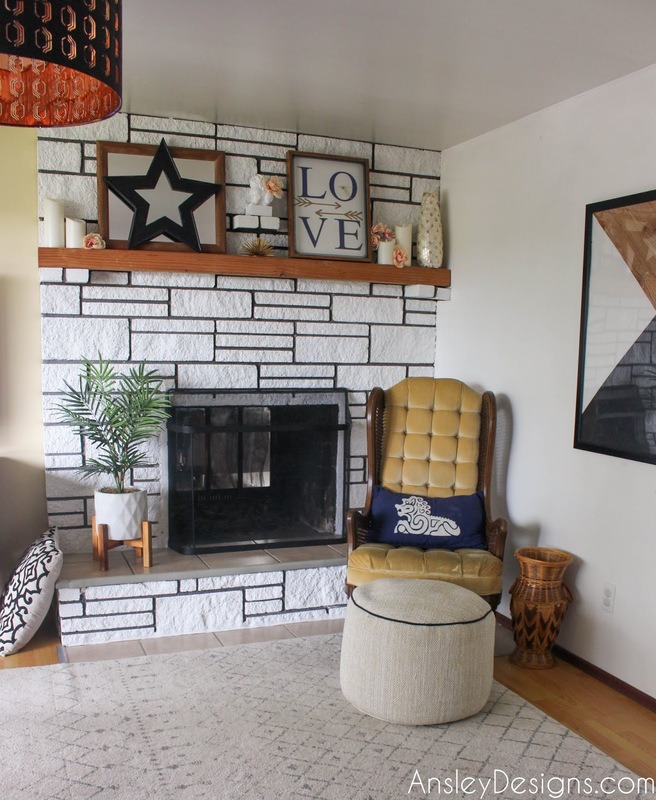 My next choice was simply a solid white fireplace. Modern, clean and wouldn't contrast too much with the taupe tile. Something told me not to paint over the grout initially..."just see how it looks, Ansley!" So, I went over a small section carefully with the roller, and I was diggin' the grout showing! Painting the fireplace was an easy simple DIY, but it was time consuming. I cleaned the stone by simply vacuuming it with my brush attachment. I could have scrubbed it down, but I'm too lazy to be a try hard. lol. Initially, I started with a very high nap roller and lightly went over a section to avoid getting paint in the grout. However, to achieve a more solid look on the stone, I was still having to go in with the paint brush for better coverage. It wasn't long at all before I gave up using the roller and stuck with the paint brush. I literally had to slather on the paint to get in all the crevices of the stone. That's what was so time consuming. I had to poke and prod, and stroke in different directions to fill all those tiny holes as best as possible. Of course the stone isn't a solid white finish, but I wanted to fill in as much as possible. Especially because the stones were different colors. I did not prime first! I just used a paint and primer in one. Lowe's told me that was okay. ;) I also removed those gold handles from the fireplace cover. They were weird and unnecessary! If you want a really fast process, use a paint sprayer! Obviously, you'll lose the grout definition, but it would turn a 2 day job (this was me doing it alone with lots of long breaks!) into a 30 minute job! I'm thrilled with how it turned out! It makes the room feel so much brighter and clean. I keep thinking I can't wait until Christmas. The mantle is going to look so much better decorated this year! Check out my DIY Love Clock that's still around and tickin'!!! Also, if you have a hearth of some sort, be sure and get yourself a fireplace protector! Confession: I didn't have one until a kiddo cracked their head on the edge. Honestly it covers up the rough edge of the tile and I think it looks better than without!